It happens to me at least once a year, or perhaps one in every several hundred pairs of tefillin I check. A parsha that just won't come out of the bayis. It is usually happens because someone very inconsiderate before me did not bother fitting the parsha properly into a suitable bayis and just forced the parsha (usually kadesh or vehaya im) letting it become the next guy's problem. So while I have my tricks of the trade that I employ to remove stubborn parshiyos, sometimes they just don't budge. And once there is no matlis or saaros left and options are very limited. My question is, what do you do when you go past the point of no return? 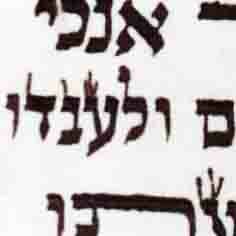 ie the parsha may be damaged from your efforts to extract it, so you cannot just leave it there. 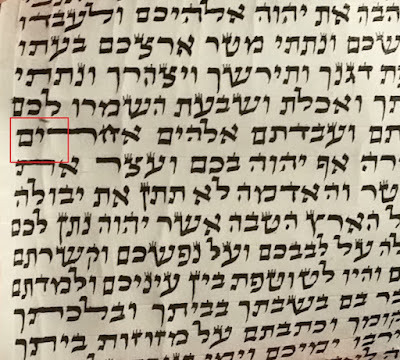 Do you replace the bayis and parsha (putting the old ones in genizah) or do you continue trying to extract it even though in doing so you could ruin it further as well as possibly damage Hashem's name, but at least you save the bayis? It is indeed a dreadful moment and one that brings much anguish. The best thing to do, is to call the client and let him know of your predicament + consequences of removing the parsha. Let the client make the call with a a full understanding of the consequences. Because of situations like the above, I have taken the practice of removing the parashiot shel rosh in reverse order. That is, removing Vehaya Im Shamoa first and then working backwards towards Kadesh. 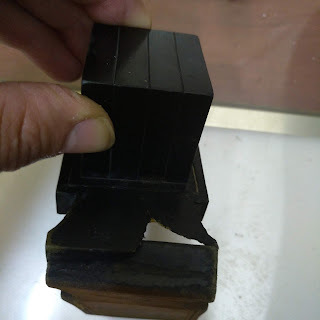 That way, if one of the parashiot is "stuck" one doesn't run into the issue of inserting them back-in out of order and invalidating the tefillin. More so, at this point, the client can be informed that a certain parasha or parashiot cannot be checked because of the one being stuck. This allows for the tefillin to be sewn back-up without invalidating them. Years ago I learned how to remove stuck parshios from the famous batim macher, R' Eliyahu Gitman. His trick works most of the time. The one way that always works, albeit can take a long time, break a good sweat and the bayis may need a little work afterwords, is to bang the bayis against a piece of pipe until the parsha eventually can be pulled out. These tricks are not something I can explain but has to be seen. It may also help to remove the filler piece in the titura so you can get closer to the parsha and sometimes the parsha gets caught on a piece of leather so, if possible, it needs to be removed, before the parsha will come out. I agree that if you get to the point where this is a risk to the parsha that you should inform the customer of his options and risks and let him decide. Make sure you don't first tear and pull out the matlis, as then you'd have to remove the parsha at that point. Also, if it is the 4th parsha then if you tear the saaros you'll have to redo the saaros so they can be pulled through the bayis. Do you have a wide assortment of mosquito clamps with and without teeth?